The Context: In multiple sclerosis, the immune system attacks myelin (the fatty substance that surrounds neurons and helps them send signals). Currently, there are no available therapies that restore lost myelin in patients. Primary progressive multiple sclerosis (PPMS) is a rarer and more severe form of the disease in which patients immediately show persistent symptoms and do not respond as well to current treatments, which primarily target the immune system. The Study: In this study, researchers discovered using PPMS patient stem cells that a phenomenon called “cell senescence” (which is most often associated with cellular aging) could play a role in PPMS by inhibiting the maturation of the cells that produce myelin. The team also identified a drug, rapamycin, that reverses cell senescence in stem cell models of the disease. The research, published in Proceedings of the National Academy of Sciences, was conducted by scientists at the University of Connecticut led by Stephen Crocker, PhD, in collaboration with the University of Edinburgh’s Anna Williams, PhD, and NYSCF Senior Research Investigator Valentina Fossati, PhD. The Importance: This study identifies a previously unknown mechanism involved in PPMS that could serve as a target for future therapies. It also suggests that intervention with rapamycin may be an effective treatment for reversing cell senescence and restoring myelination in patients. The unmet need in treating multiple sclerosis is restoring myelin— the fatty substance that surrounds them and helps them send signals. The disease results from a faulty immune attack on this tissue, which can lead to symptoms such as numbness, weakness, vision loss, tremor, fatigue, and cognitive impairment. For most multiple sclerosis patients, these symptoms will come and go for a while before they start to persist. However, for patients with a rarer and more severe form of the disease called primary-progressive multiple sclerosis (PPMS), the symptoms never undergo this “relapsing-remitting” phase and instead immediately persist. This form of multiple sclerosis, and a secondary progressive form that often follows the relapsing-remitting phase of the disease, are especially aggressive and do not respond to the majority of current treatments, which primarily target the immune system. This suggests that therapies aimed at regenerating myelin could be a more effective approach for treating this form of the disease. A new study from researchers at the University of Connecticut led by Dr. Stephen Crocker in collaboration with Dr. Anna Williams at the University of Edinburgh and NYSCF Senior Principal Investigator Dr. Valentina Fossati uses PPMS patient stem cells to identify a mechanism that could contribute to myelination dysfunction in PPMS as well as a drug that acts on this mechanism to help restore myelination. The research appears in Proceedings of the National Academy of Sciences. The researchers were interested in whether a phenomenon called “cell senescence” could play a role in PPMS pathology. Cell senescence is often associated with age, stress, and neurodegenerative disease. Since this form of cellular aging could be associated with impaired regeneration, they decided to investigate whether it was more common in MS patient cells. Interestingly, MS patients are often considered older than their years. 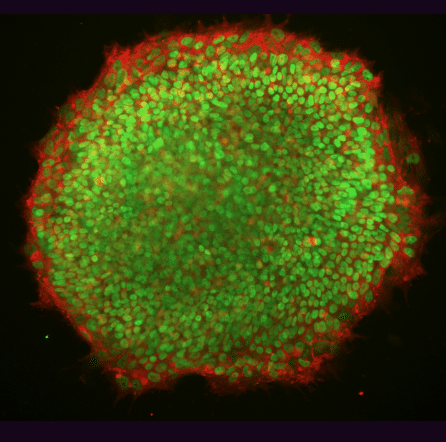 Induced pluripotent stem cells derived from a primary progressive multiple sclerosis patient and imaged by Dr. Valentina Fossati. To investigate this question, the team turned stem cells from patients with PPMS into neural progenitor cells (NPCs) and oligodendrocyte progenitor cells (OPCs). NPCs secrete molecules that promote the maturation of OPCs (the cells that go on to produce myelin) in healthy individuals. However, previous research has shown that this process is impaired in PPMS patients. Upon examining NPCs derived from PPMS patient stem cells, the scientists found markers indicative of cell senescence. When they examined autopsied brain tissue of progressive patients, they found the same markers in stem cells. The team then tested a drug called rapamycin (an FDA-approved immunosuppressant that has been found to alter the behavior of senescent cells) in the stem-cell-derived NPCs and found that it helped reverse the phenomenon, restoring the cells’ ability to promote growth and maturation of oligodendrocytes, which could in turn spark myelination. The results suggest that cell senescence is a mechanism that could be targeted in future PPMS treatments and point to rapamycin as a candidate drug for promoting myelination and ameliorating effects of the disease. Learn more about NYSCF’s multiple sclerosis research here.